With six hands to give frequent travellers a wealth of practical information, the Hornet World Timer Skeleton is a masterpiece of ingenuity. By removing much of the dial and skeletonizing many of the parts, its designers have blended function and form to create a watch whose complex mechanism is also its central design feature. Skeleton clocks and watches have been popular for centuries. The painstaking process of skeletonization involves reducing the framework – the plates, bridges and bars, as well as the dial – and the mechanical parts – mainly the wheel train – to a minimum by removing metal that is not a functional or structural requirement. 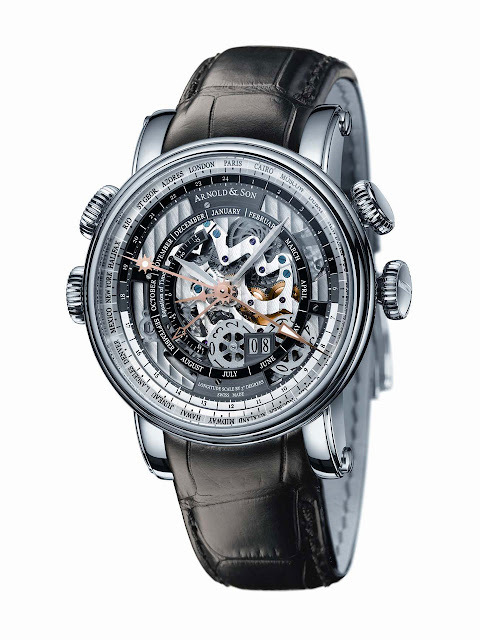 The result is an unimpeded view of the watch’s inner workings and its many parts. In the case of the Hornet World Timer Skeleton, it reveals exquisite artistic detail, from the blued screws to the Geneva stripes and circular graining running across the bridges and edges of the dial. But the feature that puts this fabulous timepiece in a class of its own is the unique combination of three unusual functions: the equation of time, the multiple time zone display and the double-disc big date display. Further indication of the watch’s complexity is provided by the six central hands, the crown and the three pushpieces that give the Hornet World Timer Skeleton its name. Apart from baton-style hour and minute hands and an arrow-tipped skeleton hand for the month, the dial features two extra-long hands, one tipped with a luminescent triangle and the other with a stylized sun, that indicate two different time zones. The golden sun hand can be set to show time zones in half- and quarter-hours, a useful aid in parts of the world like India and the Pacific. It also slides, permitting it to be set to display the mean solar time of any location according to its longitude. The sixth, and shortest, hand shows the equation of time: effectively, the difference between apparent solar and mean solar time. Running around the edge of the case are the symmetrically arranged crown and pushpieces. Apart from the crown at 3 o’clock, which is used to hand-wind the watch and set the time of day, the watch has pushpieces at 2 (to set the first time zone), 10 (for the second time zone and mean solar time adjustment), and 9 (to adjust the World Timer’s rotating outer ring). Nevertheless, despite its multifunctional technology, the Hornet World Timer Skeleton maintains the brand’s trademark clarity and user-friendly handling. The Hornet World Timer Skeleton is powered by the Arnold & Son A1766 calibre and features a big date display at 5 o’clock. It is housed in a stainless steel case measuring 47 millimetres in diameter and comes with a hand-stitched black alligator leather strap. Limited edition to just 50 watches.